This entry was posted on Monday, February 6th, 2012 at 12:00 am and is filed under Comics. You can follow any responses to this entry through the RSS 2.0 feed. Both comments and pings are currently closed. Sometimes it’s hard, but I’ll try! Haha thanks! Anything except wood that is. 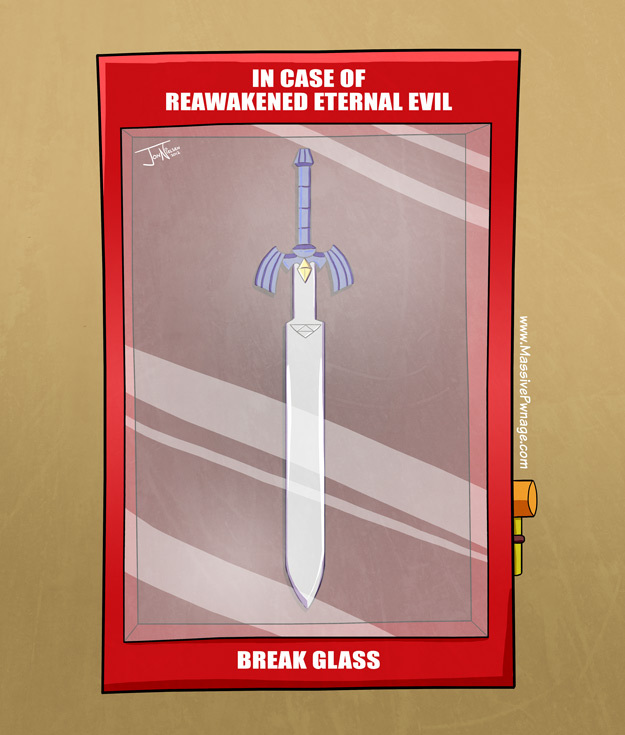 Makes me wanna make a case like that for my mastersword. In case of weeping angels. : DON’T. BLINK. Shouldn’t it be the thing the eye doctors put on you so you don’t blink? Also Killer Instinct was the best fighting game on the Super Nintendo. No exceptions. If I may make a suggestion, I think the archive should be made in to a grid gallery format. It would be much easier to find specific pictures that way because I doubt most people memorize the names of certain pictures. In case of ancient galactic dictatorship: SPIRIT BOMB. In case of Imperial Dictatorship that wears the face of Gomez: SONIC BOOM. In case of trans-dimensional alien kings: CORE DRILL. Haha This is my favorite comic of all! What if it’s deadlock sealed?